Budding Media and Film enthusiasts at The Sixth Form College, Solihull took advantage of a masterclass from the University of South Wales this week. 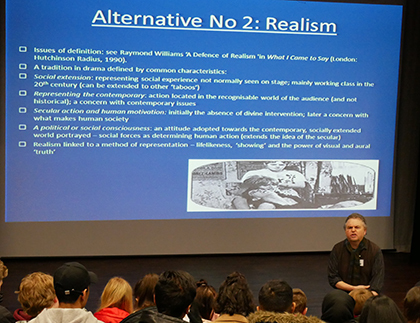 Daryl Perrins from the Faculty of Creative Industries at the University of South Wales visited the College to deliver this masterclass to A level Media Studies and Film Studies students. The 2-hour session focussed on Film codes and conventions, as well as Media theory, such as theory regarding the male gaze. In both the Film Studies and Media Studies A levels, students create their own productions, with this coursework element contributing 30% of the final A level grade. This masterclass will help them with those documentaries, which they are in the process of editing.